Austro-daimlers adr series was designed by karl rabe, who succeeded ferdinand porsche as the firms research director. With the big six-cylinder bergmeister engine, the adr6 could reach a top speed of 94 mph despite its heavy weight. Factory tuning made the model even faster. Top speed of at least 94 mph engine typedrivetrain: Overhead-cam, in-line 6 displacement 3,610 cc (3.6 l) power rating 120 hp transmission 4-speed manual chassis: Semielliptic leaf-spring suspension, independent in rear; Power-assisted cable brakes; About 3,200 lbs. Tubular chassis the adrs 3.6-litre engine had a light-alloy cylinder block and an overhead camshaft. There were two different ignition systems coil and electromagnetic. The cable brakes were power-assisted. The rabe-designed tubular backbone adr chassis with swing-axle independent rear suspension was so similar to hans ledwinkas design for the tatra 12 that the czech company filed a lawsuit. small output the big austro-daimler automobiles were too expensive for the depression era, so only about 50 adr6s were made. These had sedan, tourer or convertible bodies on one of two wheelbase lengths. Production of adrs, most notably the 1930 eight-cylinder adr8, continued even after the austro-daimler marque ended with the merger of austro-daimler-puch and steyr in 1934. 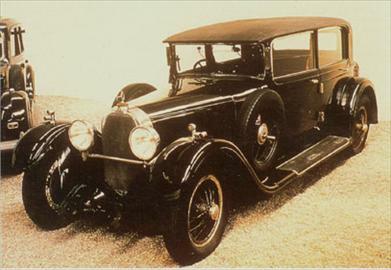 The big austro-daimler adr6 had an innovative chassis design and a powerful bergmeister six-cylinder engine.